Rally To Save The ‘39 Trylon Theater; Sun, Oct. 23rd; 2 PM to 3 PM!!! 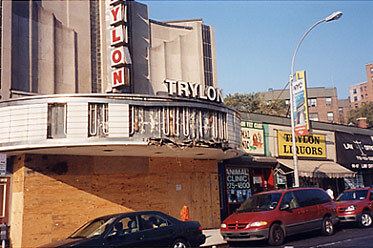 LOCATION: Trylon Theater; 98-81 Queens Blvd, Forest Hills, N.Y. Please join us in solidarity for a lawful & peaceful expression of our concerns. 1. LANDMARK the ‘39 Trylon Theater; a last standing structure which bears strong significance to the 1939 World’s Fair. 2. PRESERVE the presently intact Art Deco facade, glass block projection tower (which once illuminated Queens Blvd. ), & the marquee. 3. RESTORE what was lost during a summer 2005 conversion, despite an active construction violation & stop work order since April 2005. The Trylon Theater’s architectural features distinguish it as one of NY’s notable works of Modernism. 4. ADAPT the site for the Education Center For Russian Jewry, with a preservation-minded re-use strategy, rather than demolition. What goof smashed into the front of the theatre? The demolition men jackhammered the mosaic tiles on the ticket booth & inlaid floor, both which depicted the Trylon monument. They could have at the very least, left it intact, donated it to a museum, or installed the ticket booth/floor in another theater. The marquee is mostly intact, but decaying daily, since leaks are never repaired. Shame on them for erasing a history that pays tribute to a national treasure!!! The Oct 23rd RALLY TO SAVE THE 1939 TRYLON THEATER had a succesful turnout. It featured community residents (including the Rego Park Group), good semaritans from neighboring boroughs, as well as historical societies, & media coverage. Speeches were delivered by the following: Michael, Mr. Trylon/founder of “The Committee To Save The Trylon,” & my co-founder, Sonia. Also, Glen Leiner, Executive Director of the Art Deco Society of N.Y., & Mitchell Grubler, Executive Director of the Queens Historical Society. The Theater Historical Society of America also supported our effort, as well as the Four Boroughs Preservation Alliance, the Historic Districts Council, & Nancy Cataldi, President of the Richmond Hill Historical Society. I would also like to thank David Oats & his wife, World’s Fair historians. Media coverage: NY Post, Daily News, Times NewsWeekly, Queens Chronicle, Queens Ledger/FH Times/Queens Examiner. Check it out this week! WE ALL ACHIEVED A GREAT EFFORT TOWARDS PRESERVATION. THIS IS ONLY THE BEGINNING. We will continue, since the Trylon (& other significant structures which paint a picture of the history of Queens & NYC) deserves some JUSTICE! As I stated earlier, the LPC (Chairman Robert Tierney) not granting a fair & adequate hearing, & Councilwoman Melinda Katz ignoring the requests of her community/constituents, violates our Democratic rights. WE MUST WORK IN UNISON TO PRESERVE OUR 20TH CENTURY HERITAGE. WE MUST ALL REMEMBER: VICTORY IS DETERMINATION!!! WRITE LETTERS TO LPC CHAIRMAN TIERNEY, COUNCILWOMAN MELINDA KATZ, & MAYOR BLOOMBERG ASAP to support landmarking of this highly endangered, rare iconic gem of a theater!!!!!!!!!!!!!!!! !